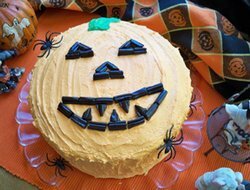 Making your own pumpkin puree is simple to do and well worth the effort. 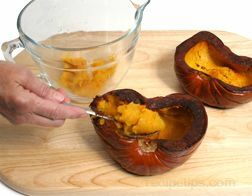 Homemade pumpkin puree can be used for making homemade pumpkin pies from scratch or in any pumpkin recipes that call for canned pumpkin. 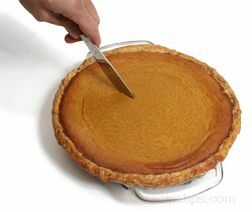 Be sure to select a small pie pumpkin for the best results. 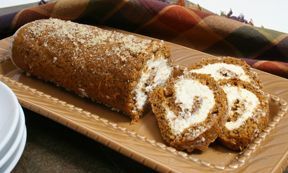 Once the puree is finished and cooled it can be used in your favorite pumpkin recipes, such as pumpkin cake, pumpkin bread or pumpkin bars, or it can be frozen to use at a later date. 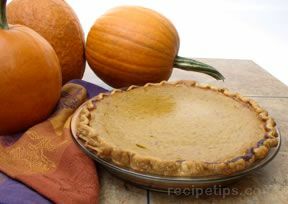 Follow our instructions in Making Homemade Pumpkin Pie from scratch to make a delicious pie that is perfect for Thanksgiving or any other special occasion. 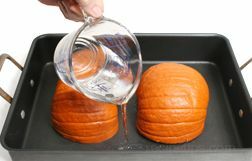 Coat the cut surface of the pumpkin halves with vegetable oil. 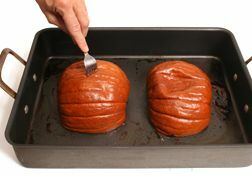 Place pumpkin halves cut side done in a roasting pan. Add 1 cup of water to the pan. 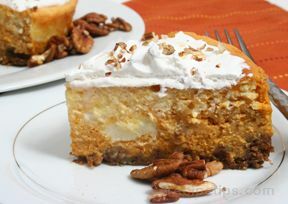 Place the pumpkin in the preheated oven and bake for 60 to 90 minutes. 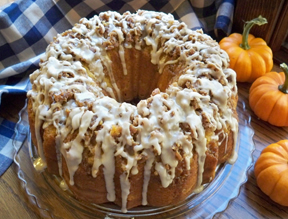 The pumpkin should be baked until the flesh is very tender. Poke with a fork to check for doneness. 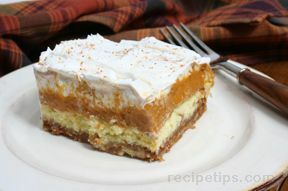 Note: The pumpkin halves can also be cooked in the microwave. 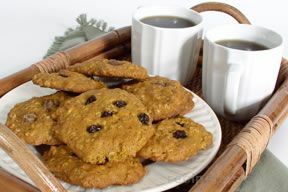 Place the halves in a microwave-safe dish, add 1 cup of water and cover. To fit properly in the microwave-safe dish, the halves may have to be cut into smaller pieces. Place in the microwave oven and cook on high for 15 minutes. Test for doneness by poking with a fork. 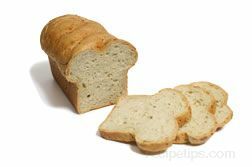 If not completely tender, return to the microwave and continue to cook for 5 minute intervals, checking tenderness after each interval. 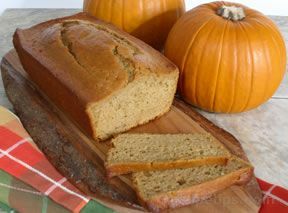 When the pumpkin has cooked to proper tenderness, remove from the oven and place on a cutting board or cooling rack. Allow to cool until it can be handled comfortably. Scrape the flesh out of the pumpkin halves and discard the skins. 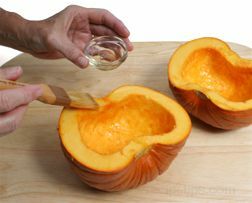 Place pumpkin flesh in a large bowl. 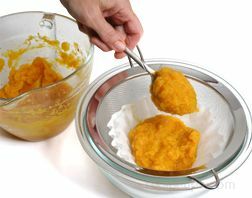 Mash the pumpkin by hand using a potato masher. Mash until all the pumpkin is a smooth consistency. 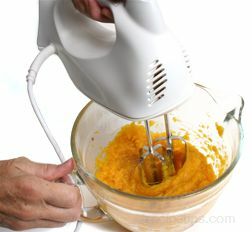 Another method that can be used to puree the pumpkin is to mix it with a hand mixer. A blender or food processor can also be used. 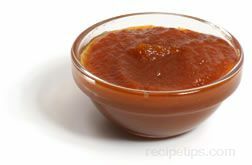 Drain moisture from the puree by placing it in a sieve lined with paper towels or a double layer of coffee filters. 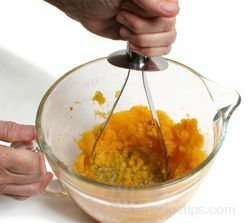 Be sure the sieve is placed in a bowl to catch the liquid as it drains from the pureed pumpkin. 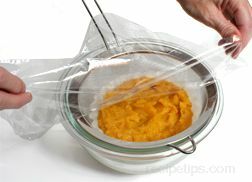 Cover the puree with plastic wrap. 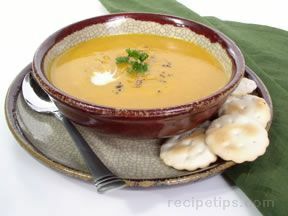 Place in the refrigerator and allow puree to drain for at least 2 hours. Drain overnight if possible. 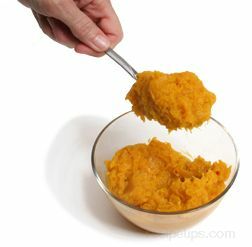 After draining, the puree should be about the same consistency as commercially canned pumpkin and can be used in any pumpkin recipe calling for canned pumpkin. 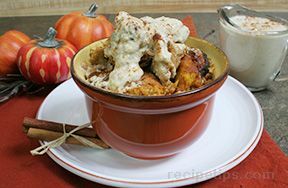 If the puree will not be used immediately, place it in an airtight container and store in the refrigerator for 24 hours. 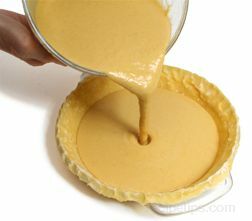 For longer storage, freeze the puree in measured quantities. Mark the container with the date, contents and quantity. Freeze up to 3 months.